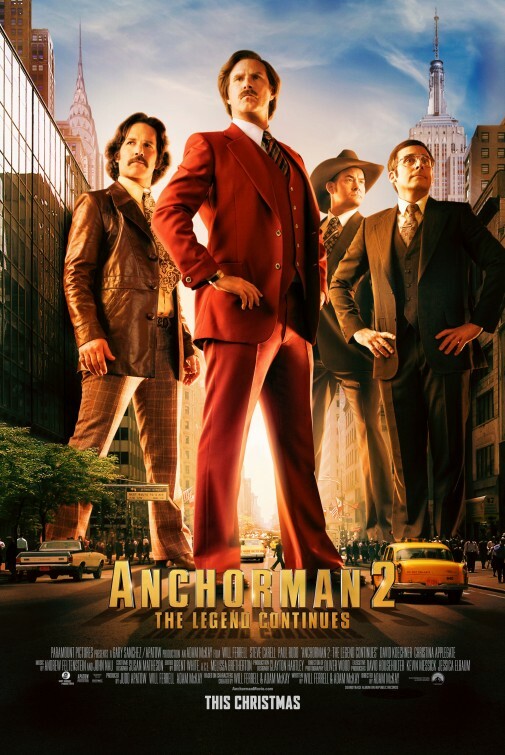 Let’s just get this out of the way right now: Anchorman 2 is not as good as the original. But, it’s only not as good in the sense that it is less quotable. Everything else– the plot, the jokes, the celebrity cameos– are spot on. This is a rare sequel that is just as enjoyable to watch as its predecessor. As far as humor goes, you’ll be getting the same kinds of silly jokes and hilarious sight gags that were in the original. Some of my favorites were jokes that seem almost like throw away lines, such as Brick telling two Canadian news anchors that he “likes their ginger ale.” It’s often the smallest, quirkiest things that make me laugh hysterically, and Anchorman continues to deliver in this regard. The biggest change between this movie and the first is the increased role given to Steve Carell. When the first was released in 2004 Carell was really only known for his work on The Daily Show and in Bruce Almighty. Since then he’s become a star in his own right, and the role of Brick Tamland was expanded in response. This was a good call. Brick had some of the silliest/stupidest lines in the first movie, and giving him his own story line added a lot of fun to this movie. Anchorman 2 also lampoons contemporary issues just as Anchorman did. While the first skewered the difficulties of being a woman in the workplace, this time around the 24 hour news networks are the target. Burgundy and his team inadvertently invent the modern “newscast” in an attempt to win a bet with another news team. They simply tell the people what they want to hear rather than what they need to hear. This sort of sensational time filler and wild speculation has been masquerading as news for so long that it’s easy to forget what actual news sounds like, and that there was a time when what Ron & Company do was considered insane and unethical. I would definitely watch Anchorman 2 again. It’s probably one of the best comedies made last year, and worthy of the original. A lot of people didn’t care for this next instalment of the legend that is Ron Burgundy. I have a feeling most of the people that were disappointed were placing too much expectation on this film. Most of the time, when a next instalment comes out over ten years later than the original, it is unlikely to ever reach the highs the original did. This is true for Anchorman 2: The Legend Continues. The film is still very funny and has a bus load of Hollywood cameos, but is it as good as the first one, probably not. The film picks up ten years after the events of the first Anchorman film. Ron Burgundy (Will Ferrell) and his wife Veronica (Christina Applegate) are newsreaders for World Broadcast News Station until Veronica is offered the lead anchor role when the prime time newsreader retires. Ron forces her to choose between him and her promotion. When she chooses the job, Ron’s life spirals out of control so much that he is reduced to announcing the Sea World dolphin show to earn a few bucks. Ron’s life is at its lowest, until Freddie Shapp (Dylan Baker) enters his life and offers him a new job as one of the newsreaders for a brand new 24 hour news station, GNN, run by an eccentric Aussie (Josh Lawson). Ron agrees on the condition he can get his old news crew from San Diego back together. He digs up Brian (Paul Rudd), Champ (David Koechner) and Brick (Steve Carell) and they head too New York to have salon quality hair and read the news. This film is very funny. It is obvious how much has changed since the first one came out. Steve Carell is a much bigger star now and is given a much larger role because of this. His awkward romantic endeavours with Kristen Wiig’s character are quite funny. Brick is the highlight of the film for me. I also really enjoyed Josh Lawson as the crazy Aussie billionaire, Kench Allenby. He is clearly making fun of another crazy billionaire, Rupert Murdoch, and his network GNN ends up being a great parody of FOX News. This film made me laugh a lot and I really loved all of the cameos. Will Ferrell has scoured through his black book to get all of his Hollywood friends to appear in this movie. Huge stars like Harrison Ford, Will Smith, Jim Carrey, Marion Cottilard, Tina Fey, Sascha Baron Cohen, Vince Vaughn, Liam Neeson and Kirsten Dunst all appear throughout the film. It is obvious stunt casting, but for a film that never attempts to take itself too seriously, it works really well. This follow up to the comedy classic Anchorman never reaches the heights of that first picture, but it is still a fun time and worth a viewing.